In Photo 1 Ray wears an airborne unit enlisted winter uniform with rank of sergeant. 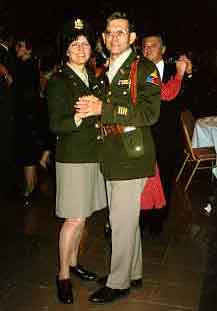 Sue wears an enlisted Woman's Army Corps (WAC) winter uniform with rank of private. 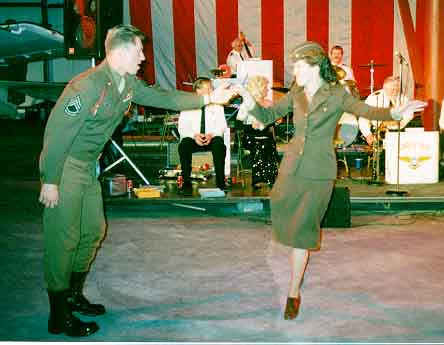 Couple is performing the Lindy basic step to Glenn Miller's "In The Mood." Bob in Army officer's summer or tropical khaki uniform with rank of Major. Couple is dancing the fox trot (Photo 2). 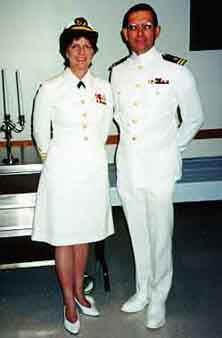 Lydia in Navy dinner dress white uniform with Lt. Cmdr Rank. Chuck is in Navy service dress white with rank of Lt. Junior Grade (Photo 3). 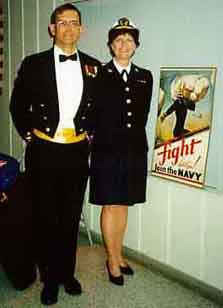 Chuck in Navy formal dinner dress blue with Lt. Cmdr. rank. 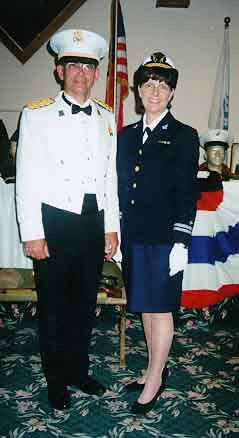 Lydia in WAVES Dinner dress blue with rank of Lt (Photo 4). Lydia in WAC officer's winter jacket and "pink" skirt with 1st Lt. rank. Chuck wears armored unit jacket with Sam Browne belt (M1921 officer's belt) and "pink"pants (Photo 5). Couple is dancing the basic box step. Dennis in enlisted brown class A uniform withtech sergeant rank. Ellen in 1940's dinner dress. Couple dancing the box step (Photo 5). 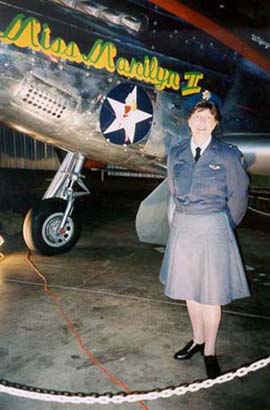 Kathy in WASP uniform. Bill in enlisted class A with tech sergeant rank. 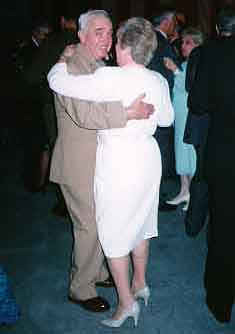 Couple dancing the Lindy (Photo 6). 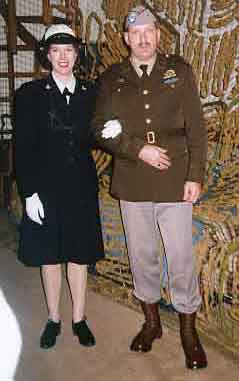 Lydia in WAC officer's tropical worsted uniform with rank of 2nd Lt. Chuck in officer's khaki cotton shirt and summer garrison cap with armored force branch insignia (Photo 7). Sue in Navy WAVES seaman first class blue uniform. Wayne in Army airborne force service jacket with "pink" pants and rank of 2nd Lt (Photo 8). Chuck in "Ike" jacket with tank destroyer branch insignia, 1st Lt. rank. 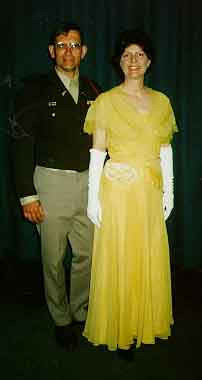 Lydia in yellow evening gown of the 1940's era (Photo 9). 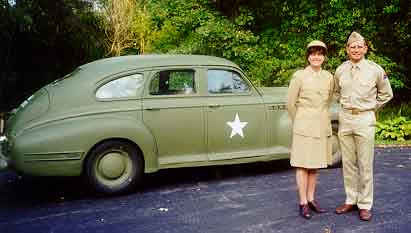 Charlotte in WAC enlisted class A with private rank. John in enlisted class A armored force uniform with corporal rank. 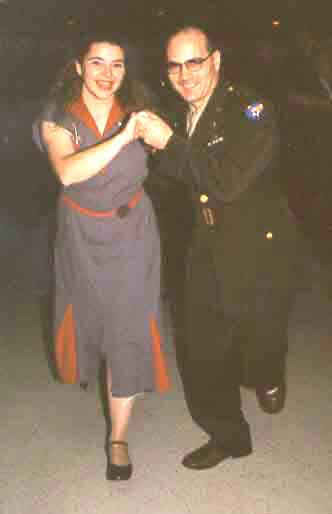 Couple dancing the box step (Photo 10). Lydia in WASP Class A uniform (Photo 13). 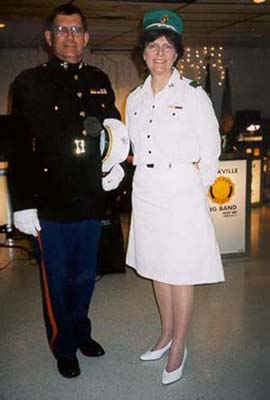 Chuck in Marine officer Class A, Lydia in Marine officer tropical dress uniform (Photo 14).